Yesterday saw North Coastal Tamil Nadu record fairly widespread rains as expected by models. The districts of Kanchipuram, Tiruvallur, Tiruvannamalai & Chennai saw the bulk of rains with some heavy duty thunderstorms hitting Chennai & its suburbs at the stroke of midnight bringing intense rainfall with it. Yesterday once again confirms the old theory during break monsoon period the Southeast Coast enjoys its best convective thunderstorm spells. While among the IMD stations the airport observatory at Meenambakkam recorded the highest of 54 mm with available data the city observatory recorded only 17 mm till 5:30 in the morning. The better spells were recorded to the West, North & South of the central business district area of Chennai which has been mostly the case this year except for Sunday when Nungambakkam recorded 8 cms rains. 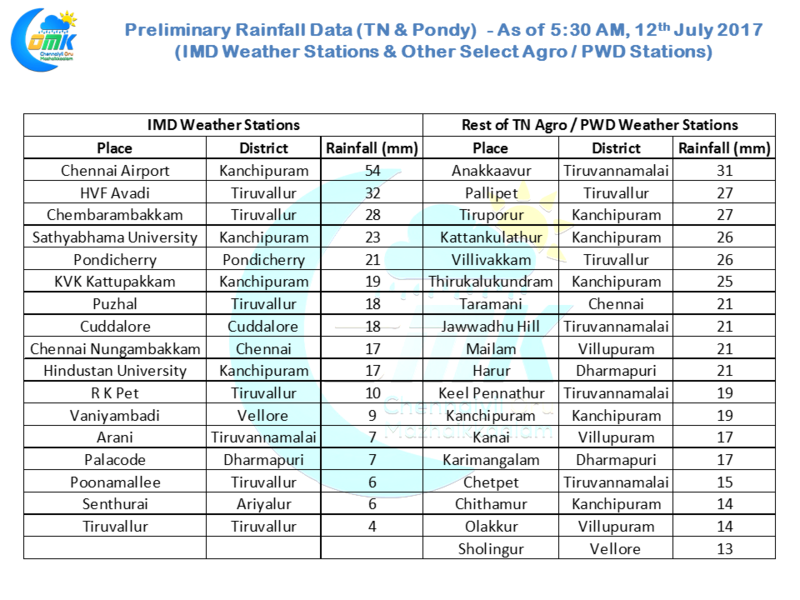 But the rainfall readings that will create the most discussions among weather bloggers will be from the Tamil Nadu Agriculutural University weather stations which showed how intense the thunderstorms through their hourly readings. Standing out is Sholavaram the Northern Suburb of Chennai recording 17 cms in all with about 11 cms falling in just one hour between 12:00 and 1:00 AM. It was similar story across most places around Chennai in Tiruvallur district. Acharapakkam, Vandavasi recorded its heaviest rains a little earlier through a different batch of thunderstorms along with Vembakkam & Marakkanam. Today in all probability could be a quiet day for North Tamil Nadu & South Andhra Pradesh with cloudy skies expected during the early parts of the day. Remnant thunderstorms are still lingering over large tracts of area providing light rains / drizzles. This is likely to prevent any conducive conditions for convective thunderstorms to develop over the course of the day. South TN under possibly more clearer skies could see some isolated thunderstorms develop later in the day with one or two places seeing rains during late afternoon between Ramanathapuram & Delta stretch.